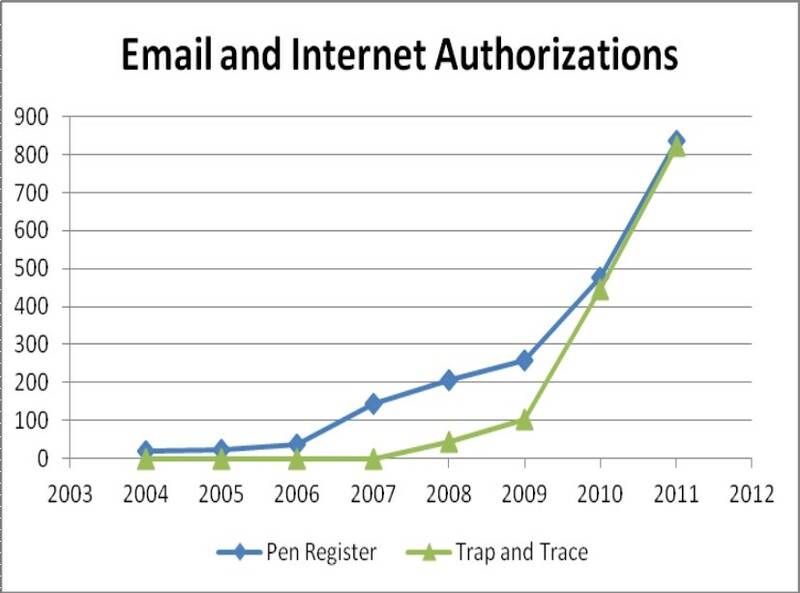 Pen registers obtain, in real time, non-content information of outbound telephone and internet communications, such as phone numbers dialed, and the sender and recipient (and sometimes subject line) of an e-mail message. A trap-and-trace acquires the same information, but for inbound communications to a target. These terms originally referred to hardware devices law enforcement could attach to the phone network to capture information about (but not the contents of) phone calls. Today’s telephone networks have the ability to capture this information without any special equipment. And the government has expanded the concept to include other forms of communication such as email. The legal standard for conducting this kind of non-content surveillance is less stringent than the rules for conducting a wiretap. To get a wiretap order, the government must convince a judge that it is essential to an investigation, but judges are required to sign off on pen register orders when the authorities say the information is relevant to an investigation. No probable-cause warrant is needed to obtain the data. In 2001, the DoJ issued only 5,683 reported “original orders.” (.pdf) Fast forward to 2011, the latest year for which data is available, the number skyrocketed to 37,616 — a more than sixfold increase. Though these can be used to track e-mail, the vast majority are used to get information on mobile phone users’ phone calls and texts. Consider that last year mobile carriers responded to a staggering 1.3 million law enforcement requests — which come from federal, state and local police, as well as from administrative offices – for subscriber information, including text messages and phone location data. That’s according to data provided to Congress that was released in July. The nation’s major phone providers said they were working around the clock and charging millions in fees to keep up with ever-growing demands. Not surprisingly, the number of people affected by such orders has jumped as well – consider the below chart on the number of people who the DoJ got information about using trap-and-traces and pen registers. The Electronic Frontier Foundation, in ongoing litigation, claims that the National Security Agency, with the help of the nation’s telecoms, is hijacking all electronic communications. 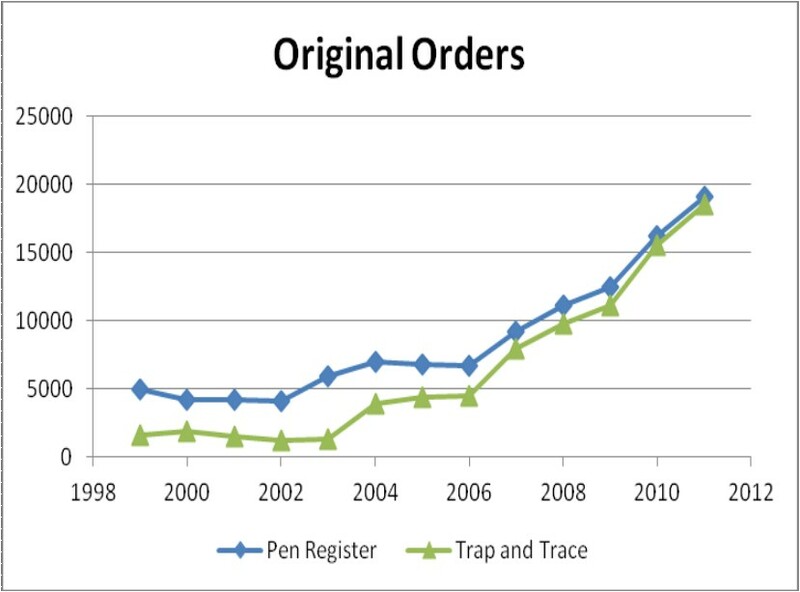 While the growth rate for Internet surveillance is high, such surveillance still accounts for a tiny fraction of pen register and trap-and-trace orders overall. In 2011, only about 800 of each type of order was issued for Internet traffic, compared to almost 20,000 of each type of order for telephones. While it’s useful for the public to have these statistics, they give just one small piece of the overall surveillance puzzle. 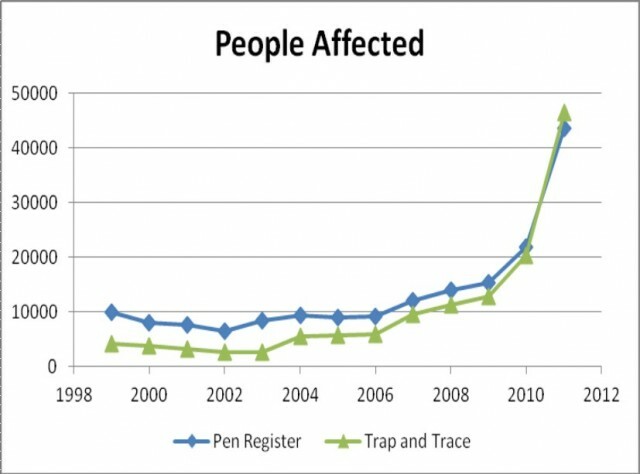 For example, these statistics likely don’t include cell phone location tracking by law enforcement. They also omit government access to emails stored by third party providers. And they entirely exclude the National Security Agency’s warrantless wiretapping program under the FISA Amendment Act. While hard numbers are hard to obtain, what little evidence we do have suggests that all of these forms of surveillance have been increasing. Why is the government spying on us so much more than it did just a decade ago? The terrorist attacks on September 11, 2001 were surely one motivating factor. But it can hardly explain the sharp increase in the last two years. Another important factor is likely just supply and demand. As information technology in general has gotten cheaper and more powerful, the technology to capture and store large amounts of intercepted data has also gotten cheaper. So economic constraints that limited the amount of data the government could collect in the past has become less and less of a constraint.